Winclone 6 is the most complete solution for protecting your Boot Camp Windows system against data loss. Winclone is the most reliable cloning solution when migrating Boot Camp to a new Mac. The Winclone Backup feature provides scheduled, incremental snapshots of the Windows User folder for retrieval of earlier versions or deleted data. Winclone 6 supports cloning and restoring Boot Camp on Apple’s new USB-C MacBook and MacBook Pro models. Mount Boot Camp or other NTFS drives in read/write mode whenever you need to copy data between Mac and Windows volumes. A fresh Toolbar for Easy Access to Tutorial Videos, Tech Support, In-App Upgrades and more! Deploy on up to 50 Mac clients. Backing up data reliably is an essential part of computer maintenance for both disaster and accidental file deletion. The Winclone Backup service ships with every edition of Winclone 6 and automatically saves a daily incremental backup of the Windows User folder. The combination of periodically saving a full Winclone image of Boot Camp and automatic daily backups helps ensures a speedy and complete recovery from data loss in the event of a disaster. 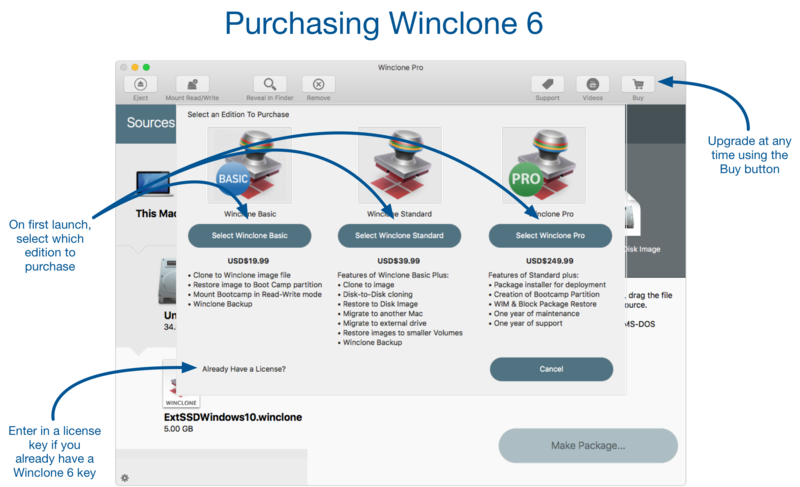 Winclone 6 Pro includes a package installer for managed deployment of Boot Camp to multiple Macs. Winclone packages can be deployed using all the Mac management tools available today. If you can deploy a package, you can deploy a Boot Camp partition. Need Winclone for previous versions of OS X or Windows? Get a legacy version. Winclone is a deceptively simple yet effective Mac app that takes care of your Bootcamp backup, restore, and partition resizing needs. My only regret is that I didn’t get it a lot sooner! When we rolled out the first few machines with Bootcamp we were unsure how much disk space our users would need on the Windows partition. We ended up creating a Windows disk that was too small. I was able to use Winclone to make the windows partition bigger for one user. I followed the steps in the online tutorial and the entire process was super easy and worked perfectly. I can’t thank you enough for helping me. I am surely gonna recommend Twocanoes to my Bootcamp-Friends. I am amazed by Winclone. Everything is back where it should be and working as before, truly amazing. I don’t know what I would have done without it. Incredible. I’m really impressed about your knowledge, the quickness of the response mails and about the support (from) your company in general. WHAT: We cover the basics of Winclone, and we answer your questions. Last Updated On April 13, 2019On the 2012 MacBook Pro, audio may not work in Windows after restoring a Winclone image. To resolve this, do not boot into Windows after restore the image. Open Winclone and select Tools->Make Legacy Bootable. Select the volume that the Winclone image was restored onto, and click Make Legacy Bootable….